Major utility Dominion recently successfully completed its first wind power project in West Virginia-the 264 MW NedPower Mount Storm project with Shell WindEnergy. The company is now working on another wind project in Indiana and looking at additional projects in Virginia and Illinois. Kelly Scott, director of fossil fuels and hydro operations for power company Dominion, puts it succinctly when talking about the weather and wind around the company's recently completed NedPower Mount Storm wind power project in West Virginia. "Well, they don't call it Mount Storm for nothing-the wind really does blow up there," he says. And from Dominion's perspective-and that of its joint venture partner, Shell WindEnergy-that is just fine. 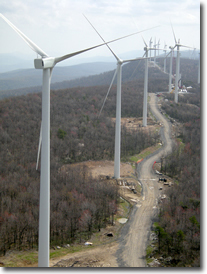 Construction wrapped up in late 2008 on the 264 MW NedPower Mount Storm project, which is about 120 miles west of Washington, D.C., in the high ridges of West Virginia. It is only the second wind farm project in a state known more for its coal mines that fuel many thermal power plants in the U.S.
NedPower Mount Storm is also the very first wind power project for Dominion. As one of the country's largest energy producers and distributors, Dominion already has huge power generation facilities from nuclear to coal-and is looking to do more wind power projects in the future. It has roughly 1,300 megawatts of renewable generation in operation, under construction, or in development. Dominion's coal-powered Mount Storm station is only two miles from the wind project site, which proved to be a benefit in terms of having local knowledge and tying into the grid. "We've had a presence in this area for a long time, since the 1960s," explains Diane Leopold, vice-president of fossil fuels and merchant operations for Dominion. "We knew the area had good wind resources, and there was a lot of wind data available." The original developers of NedPower Mount Storm started the project process back in 2002, applying for the necessary Certificate of Convenience and Necessity (CCN) from the state of West Virginia. The CCN was granted with some pre-conditions, largely regarding doing some pre-construction wildlife and wetlands surveys. These were completed in 2006, and the final CCN was issued. Shell WindEnergy bought the development in 2006, and Dominion became a partner later that same year. "Part of the reason why the process took some time was that it involved charting what amounted to uncharted waters, at the time, with West Virginia and wind power projects in the state," notes Kelly Scott. "At that point, no one had built a wind farm in West Virginia, so the state was working on coming up with conditions that had to be met. It took some time to get through that process the first time." The only other wind power project currently in the state is FPL Energy's 66 MW Mountaineer Wind Energy Center. Although NedPower Mount Storm was only the second wind power project in the state, alternative energy has gathered some momentum in West Virginia. The current West Virginia governor is on board with developing alternative energy sources. Earlier this year, Governor Joe Manchin introduced a proposed Alternative and Renewable Energy Portfolio Standard that would require electric utilities to obtain 25 percent of their power from renewable energy resources by 2025. Manchin defined renewable as including wind, solar, and clean coal technology. Most of the state's electrical power comes from coal-powered plants, and there was likely a bit of an information-sharing process going on with the state regarding the wind projects, says Scott. "We were not involved at the very early stages of the project, but talking with the people who were involved, it seemed that way-it was kind of a new energy animal for the state." But it is an energy animal that is supported by the state (see sidebar story). Diane Leopold notes that regardless which state is involved with a wind project, there is still a large amount of research required in the permitting stage, with environmental and wind studies, the site layout, the permits, and the land leases-and it all takes time. In terms of data, Dominion-with its nearby existing power plant-had a head start. The company had been collecting wind data in the area since 1986. National Renewable Energy Laboratory maps showed the region, known as the Allegheny Front, as possessing excellent wind resources. "It's actually a high plateau, and then it drops right off-and that's why it's called the Allegheny Front," explains Scott. "There is a lot of exposed rock, and it's very, very rugged terrain. It's pretty barren-near the drop off of the front, there is little vegetation and few trees." Trees that have grown on the site have been shaped by the very strong westerly winds-an obviously good sign when you're looking to locate a wind power project. The project site, which follows the ridgeline for 12 miles to optimize wind for the turbines, is about 8,000 acres in size. The company dealt with 35 landowners for leases. "But not every landowner has a turbine on their site," noted Scott. "Most of the properties have turbines, but there are some where the land was just used for infrastructure. We needed that amount of land to get access to the turbines, for the roads, for underground power lines." In terms of construction, the project was definitely a challenge, says Scott, primarily due to its location and the harsh terrain. It helped that some roads (built for Dominion's nearby coal powered station) were already in place. "But to get into the actual area where the turbines were erected, we had to cut roads, and some of this area was granite. And we had to do a lot of significant rock work just to pour the turbine foundations," says Scott. The site is essentially on a mountain ridge-the Allegheny Front has an elevation of 3,100 feet-so they had to truck all the equipment up these roads. Huge cranes had to be trucked in to the site in multiple pieces and then assembled to erect the turbines. Once up on the ridge, two-lane roads were built from turbine to turbine. "We tried to leverage, as much as possible, the existing roads-but we still had a total of 18 miles to connect the dots, if you will, for the wind farm," says Scott. The contractor on NedPower Mount Storm-which used 132 Gamesa G80 2-MW turbines-was M. A. Mortenson, a veteran of many wind farm construction projects. A reasonable number of "wind days"-days when it would be unsafe to make lifts with the cranes due to very high winds-were built into the construction schedule, but the weather and wind, not surprisingly, do not always neatly fit with construction schedules. They had a few more wind days than anticipated and some severe weather. "It actually snowed in August-I can attest to that," says Scott. As with many wind power projects, its size, in terms of power generation, was directly influenced by the available interconnect to the grid. In this case, they were able to tap into a 500 kv transmission line that runs east to west and connects up with Dominion's existing power station. Dominion and Shell WindEnergy also wanted the project to be a reasonable size because of the logistics and costs involved in building it. "You want to achieve some economies of scale," says Scott. 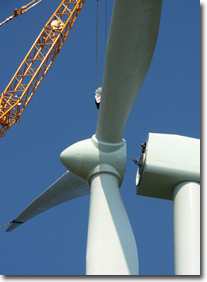 "The logistics of mobilizing the workforce to erect the turbines on this site was huge. If you can spread the costs over more turbines and more megawatts, that's a huge benefit." Diane Leopold says that with NedPower Mount Storm being the company's first wind power project, it made a lot of sense to partner up with an experienced wind player. "Shell WindEnergy has been a great partner for this first wind project for us," she said. "Dominion has a lot of experience developing power projects in general, so I think leveraging the talents of both companies with NedPower Mount Storm was a good approach." She noted that Dominion, with its broad portfolio of projects and more than 27,000 MW of power generation under management, brings a lot of development and operations horsepower to any power project that it works on. "Wind power projects are different in some regards, but they can also be very similar to other power projects. I think that the skill set we have at Dominion-our background in construction, operation, and maintenance of traditional power projects-can be related directly to wind power projects. "We are very used to the permitting, the engineering, the construction, and dealing with compliance and environmental issues-and all of these cross over, no matter what the type of power project." But there are some significant differences, she added. For example, they are dealing with 132 smaller-capacity turbines on NedPower vs. the four or five large-capacity turbines on a traditional power plant site. A traditional power plant site might be 50 or 60 acres vs. the 8,000 acres for NedPower. "From an operations standpoint, there is more emphasis on communicating with all the turbines and being able to see how all the turbines are doing at any one time. This poses challenges not seen at a traditional power plant," says Leopold. Dominion-along with Shell WindEnergy-is a developer/owner of the project. Leopold emphasized that Dominion's business model has a strong focus on the ownership side-and that they plan on being an owner of NedPower Mount Storm for the long term. "We're in it for the long haul, and we take our local relationships very seriously." As much as it is on board with wind power, Dominion (as a major energy producer operating in 14 states) fully realizes that wind is still going to be only one part of the energy picture going forward. "We're committed to proceeding with developments in wind, but it's not the answer to all of our energy needs," notes Leopold. Kelly Scott says that the big challenge in further developing wind power will be in finding good sites. "There are a lot of areas with good wind resources, but what was unique about NedPower was there was the 500 kv line that went right through the site. That meant you could put together a project package where you could get the power to the grid very quickly. "I think that's still the prime challenge-finding these really good locations where you can tap right into the grid." And, he adds, being close to the load centers. In the U.S. as a whole, he notes, some of the best wind resources are quite a distance from major population centers. "There is a tremendous challenge of building up the grid, and the grid accommodating an intermittent resource. There are challenges to how much power can be accepted on certain transmission lines because many lines are nearing their maximum capacity." Utility companies-Dominion included-are not shy about taking on challenges, however. Work is ongoing on the Fowler Ridge Wind Farm-a joint venture project between Dominion and BP Wind Energy-which is located about 90 miles northwest of Indianapolis and is expected to generate 750 MW. Dominion and BP Wind Energy are also currently evaluating wind energy projects in Virginia, and Dominion plans to build a 300-megawatt wind generation facility in Central Illinois. Wind power projects are a good fit for Dominion, says Diane Leopold. "Wind is very complementary to our balanced portfolio-with coal, oil, natural gas, biomass, and nuclear." Adding more renewable energy into the mix makes good business sense for the company, especially because some of the states they operate in-such as Virginia and North Carolina-now have Renewable Portfolio Standards. "We're very committed to meeting the RPS goals, and we also have an interest in reducing our carbon intensity and in hedging against rising fuel costs," says Leopold. "We're very excited about the addition of these wind projects."